Acoustic Guitar Parts | Gear Acquisition Syndrome!! For my birthday this past Memorial Day weekend, I got a rockin’, G.A.S.-y gift! I had specifically asked for certain acoustic guitar parts, and my family, being the awesome examples of humans that they are, had some nicely wrapped and ready for my open hands as soon as I got up. My New Bone Bridge Pins! The present was deceptively small for the considerable impact it will make. I removed the paper, opened the box lid, and lifted out the packet that lay inside. 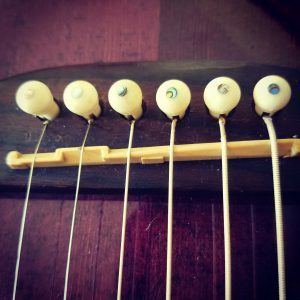 I looked through the clear plastic baggie, and viewed what I had been anticipating… six cream-colored guitar bridge pins…. What I CAN tell you is that swapping my old pins out for these new bone ones made an immediate difference in the sound produced by my Ibanez AE acoustic guitar. So does replacing parts, like pins, saddles, nuts and such, really make that much of a difference? 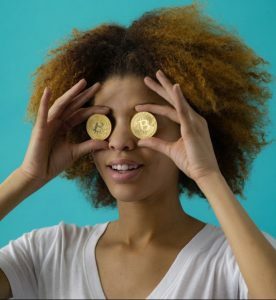 Funny you should ask… ! 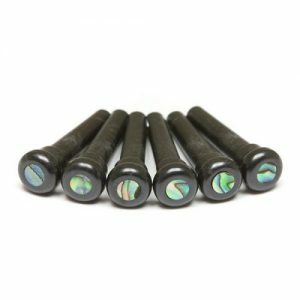 No Petrochemical Synthetic Polymer Malleables! We all know that we get what we pay for. For guitars under, say, $800, it’s pretty common to find lots of parts made of (wait for it… ) PLASTIC. That soft, shape-shifting polymer is everywhere; there’s probably not a single room in your whole house that doesn’t have something plastic. In fact, it’s so ubiquitous, our oceans are full of it and damaging wildlife and the environment. But… is it a good choice for the tone-transferring parts of instruments?? Not really. The reason mostly has to do with its mass: it’s just too soft. Soft materials will never pass along vibration as well as harder, more dense materials. 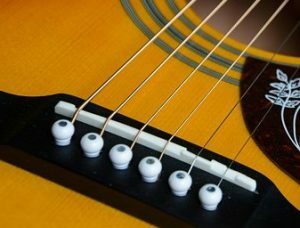 Add to that, that because of its softness, many find their strings cutting into the plastic nuts or saddles over time, deep enough that the notes become cut short and “muffled” sounding. Definitely not a boost towards optimal tone! If you record acoustic guitar with microphones frequently, as I do, you know how important it is to eke out every bit of impressiveness that you can. If we optimize critical components by getting rid of plastic, we’ll find we’ve taken a beneficial step in the right direction. 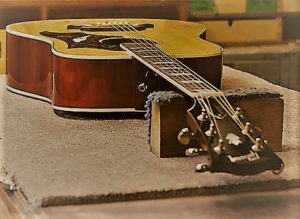 Here’s what I’ve noticed: when you swap out the plastic nut, saddle and pins on an acoustic guitar for another material, you eliminate a kind of “banjo sound” that plastic produces. The mid-high frequencies seem to be more pronounced by plastic, as well as a muddy low-end. I also find that plastic emphasizes and DE-emphasizes certain frequency RANGES. This (to my ears) makes the sound more… well, I guess the best word is “separated”. It sounds less like a cohesive team of tones, and more like disjointed ranges of notes, throwing dodge balls at each other… in a gymnasium… with green fluorescent lights! To see what I mean first-hand, just LISTEN TO THIS. In a nutshell, use plastic parts and you’ll sacrifice clarity of fundamental notes, sustain, low bass & overtone frequencies and even, full-bodied tone. The video above shows us that the difference in materials can produce staggeringly apparent sound differences! But how can the material used to make pieces that are so small make such a difference?? The combination of these cuts, boosts and transfers is what produces the specific “sound” of your guitar. 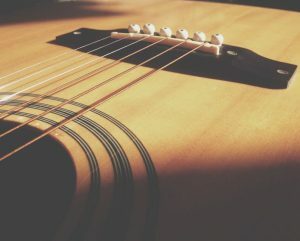 So, when you strum or pick an acoustic, the vibration of the strings passes through the saddle, the bridge, the bridge pins, and into the top wooden sound board. All of those cut, boost and transfer frequencies. If one (or more!) of those is made of a substance that stifles vibrations (e.g. plastic), then instead of resonating them, a significant part of your sound, my friend, will just be stolen. And the police can’t help ya!! The biggest reason to upgrade from plastic? For me, it’s because parts made of bone produce a more EVENLY-REPRESENTED frequency spectrum. No matter what I play, it sounds like the frequencies are all a cohesive unit, instead of islands of tone that just happen to be in the same room. The materials you make a musical instrument with matter a lot. If you just want something with 6 strings to play around a campfire every few times a year, then… whatever, put strings on a rake. But if quality of sound is your goal, you MUST consider what raw materials make up your melody-making tool. So, given that plastic is such a poor medium for vibrational transfer, what other options do we have?? My birthday gift was BONE bridge pins. Bone is definitely a denser material than plastic, so right away we know that we are going to get better sound transference. I personally found more volume, more sustain, more clarity in tonal center and more evident harmonic content in my Ibanez AE, just from switching from plastic to bone pins! 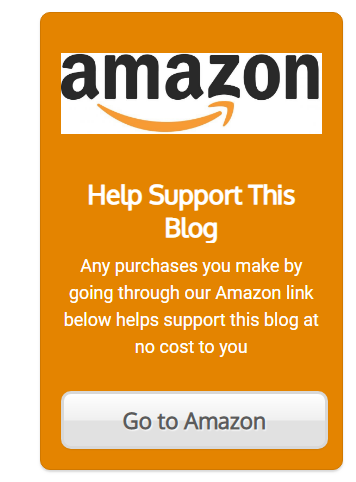 How cool, that we can gain a real boost to our tone for under $20! If you’re wondering what KIND of bone you’ll get, well, sadly there’s no way of knowing unless you ask the company you purchase through, and even then the person you get on the phone might not know. Most of the time you’re probably getting COW. They use many of the more dense bones of our moo-ing ex-friends, and probably will continue to, as long as humans eat meat, which (tho’ I’m a vegetarian) probably will not end anytime soon. The only downside I’ve read about using bone is that, because it’s an organic substance, its density isn’t consistent throughout. In other words, there could be some “dead spots” under certain strings as opposed to others. This makes sense from a scientific standpoint, and the sonic transfer could be affected. Anything that’s alive, or even was alive, will have an unpredictable, organic differences. I get that. Still, the upgrade to bone from plastic was such a clear winner to my ears… even if that IS true, it doesn’t matter to me. So, did you notice the wildly anachronistic animal on the list above?? How in the name of Gibson did that get on there??! Let’s see, shall we… ?! Did you know that, for over 300 years, there has been a legal ivory trade coming out of Siberia… of woolly mammoths?! It’s quite common to dig up the remains of these great beasts in that region. They preferred it there for some reason. Maybe the tundra ice kept their flowing hair locks moisturized! Regardless, even today it’s still legal to trade for the ivory in the tusks of these animals. 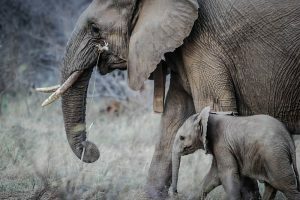 Yes, MAMMOTH IVORY is rare, and costly, but come on… who wouldn’t want to make a connection with an impressive creature that’s been extinct for thousands of years? Imagine how its massive mojo could burnish up your tone! Mesmerizing!! 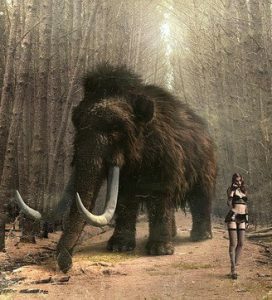 Some scientists estimate that there are probably still 10 million mammoths carcasses buried in Siberia, based on the rate and regions of discovery thus far. So, if you aren’t scared away by price tags that are usually over a hundred bucks, go get for your most favored guitar a set of woolly mammoth bridge pins (like THE ONES HERE) and spread your impressive story to anyone who even MENTIONS your guitar. So? How would you describe the tone difference you heard in the video? I like it. In fact… I think I’m gonna look into swapping out my bridge now… ! 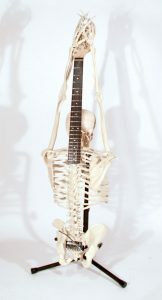 It’s important to differentiate, when shopping for guitar parts, between bone and ivory. There is a difference. The tusks of an animal, what is designated “IVORY“, are of a much denser nature than the bones of that same animal. Tusks are basically teeth that have grown out of an animals mouth. They are not considered bone, and they are more prized as a sound transferring material because of their denser characteristics. Alas, even tho’ they are better at sound transference, a political movement has all but eliminated it as a chose for musicians. In 2014 the U.S. Department of the Interior implemented a ban on IVORY, because way too many elephants were being killed for it. That ban is still in effect today. This had sweeping ramifications for many industries, but the music instrument business was hit extremely hard. For decades, ivory had been used for tuners, saddles, nuts, bindings and purfling… Now suddenly that raw material was off-limits. There is also legislation out there still protecting walrus, rhinos and even narwhals (“hope you find your dad, Buddy”)! They were, for hundreds of years, all secondary sources for international ivory trade. It’s a good feeling to know the lives of rhinos, elephants and walruses the world over are being saved out of extinction. But the instrument companies still had to stay in business, and they needed alternatives FAST! It’s similar to what happened in 1929, the year of the stock market crash that caused the Great Depression: From that point the makers of PIANOS started substituting plastic on top of their piano keys instead of ivory, to cut costs and try to survive through one of the worst financial debacles in history. 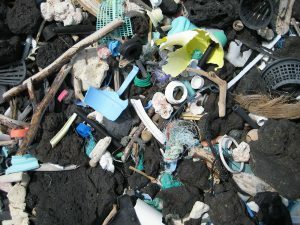 In both cases, though for different reasons and at different times, plastic started being used in droves. It saved the day, but it did not save the TONE. As a substitute for ivory, plastic is, in a word, inferior. We now move on to using material that, yes, was still “alive” once, but is much more accepted as a raw material, and causes less political rallies: WOOD. If you have a guitar that you feel is too bright, and overly ringy, then you could benefit from swapping your parts out for wooden replacement. One luthier online even said he had a guitar come in once that had a nut made of (are you ready?! )… matchsticks! For an excellent example of EBONY versus PLASTIC, go watch THIS VIDEO. If your ears are like mine, it’s pretty obvious which are gonna win the “I Sound Better Than You” award! 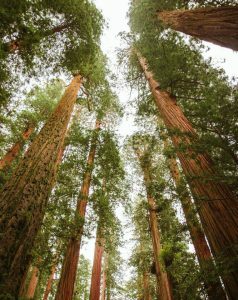 One thing to remember about wood: it always grows or shrinks based on temperature. So adding more wooden parts to your already-mostly-wood guitar will cause it to be even more susceptible to environmental changes. Finicky about tuning? You have been warned! Many say a close second to using bone components, or even better than bone, is switching out your plastic with “Tusq” parts. It’s basically man-made ivory made by a company called Graph Tech. Those who are Tusq adherents say that you get a more consistent delivery of vibration from this material because it’s totally consistent in mass, thickness and density. 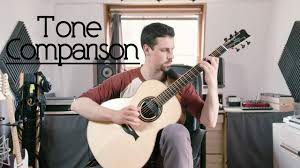 They will tell you the shortcomings of bone, based on the ‘dead spots’ I mentioned, and share the many companies that now ship guitars with Tusq instead of plastic. Without question, it’s a great step up from plastic. I myself am toying with buying some Tusq parts just to test ’em out. Although I didn’t see it a lot, you can, if you dig deep enough online, find acoustic guitar parts made of metal. To hear a shootout between BONE and BRASS pins, watch THIS VIDEO. Sounds like going this route really livens up your tone in the high frequencies. I could definitely hear the more “metallic tone” when he used the brass pins. 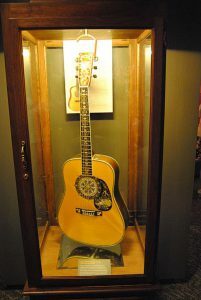 In fact, it reminded me of playing a Resonator guitar (check those unique creatures in THIS POST), only with the metallic quotient dialed back quite a bit. Regardless, you will certainly get a different sound, no question, and often that’s just the ticket for livening up your mix or your live tones! But I thought we said that artificial polymers were bad?? Well, certainly any man-made material that is SOFT is going to work against you on a guitar. The ones listed above are all much denser, and thus better sounding than plastic. Remember that, at the end of the day, whatever materials you use on your axe, it’s about how it SOUNDS TO YOU. The ear of the beholder reigns, and for both the player and listener, if it sounds right, it IS right. What’s great is that a lot of these material upgrades to your axe don’t have to come at a premium. Many are CHEAP! And as anyone knows… cheap is good for G.A.S.! 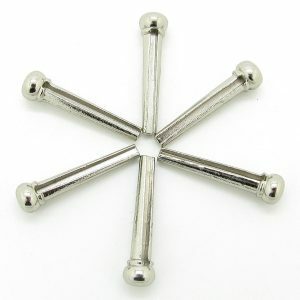 Check out THESE BONE PINS that you can have caressing your tone-lusty ears in mere days. Or THIS SADDLE & NUT COMBO pack that will not only enliven your sound, it’ll take your guitar’s style up a notch or two! Or just get everything all in one package, LIKE THIS KIT, and really turn the tables on your tone! It can’t hurt, doesn’t cost much and just might take your sound up to the next level for hardly any investment. Sounds like my kind of Gear Acquisition! So now that we know all about our options for switching out the nut, pins and saddle… can we do it ourselves? Yes! But only if you feel comfortable, knowledgeable and skillful enough to take on the task. I would also take my guitar to a luthier IF I found the saddle to be GLUED into the bridge. This is not standard procedure, so you probably won’t come across that problem, but if you do… don’t try to rip it out yourself. That could damage your bridge and soundboard badly. How about electric guitars? I don’t find they need swapping as much, personally. That’s probably because there’s so many other factors at play in an electric: pickups, metal bridges, tremolo systems, cables, amps, effects… under that avalanche of tonal elements swapping out a nut would not be nearly as noticeable. But in acoustics the difference screams. As a final caveat to all this talk of upping your game tonally, I must mention… none of this material-swapping will be a magic bullet to your sound unless you make sure that every piece you put on is CUT correctly, or shaped appropriately, for the guitar in question. 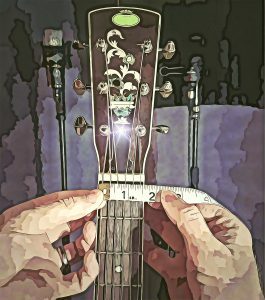 Measure your guitar parts before you buy. This will ensure that you get the same size nut, saddle and pins that will fit your guitar. Then, when you get the right-sized piece, make sure the strings naturally sit where they should. If it looks like they don’t want to sit where the slots have been cut in the nut, for example, you may have to get the nut recut or buy another one that fits better. Even pins can be different, tho’ they’re not so much of an issue. I have one guitar where the pins were a little larger than what the guitar came with. They stick up about 2 mm higher than they should, but they’ve never popped out once I put new strings on and still improved the sound. I find that most guitars will take these add-ons just fine, with no needed trips to a local luthier. But keep your eyes open… some guitars are made… well, just a little differently! The best way I can think of to finish this article is to give you a taste of the options I’ve discussed. I planned on doing a video shoot-out, but guess what? Sotos already did a great one, so I figured why re-invent the wheel? Sotos Bakas is an excellent musician and gear geek from Athens, Greece. In researching guitar parts materials, I came across the parts comparison he has online. He did a bang-up job! He kept everything the same except the parts, watched his proximities, played the same music… the perfect way to really hone in on the parts in question. And even more… he plays beautifully! So to get instant insight into the tonal varieties of guitar part materials, watch Sotos in THIS VIDEO. Thanks for that outstanding comparison, Sotos. You ROCKED it!! My suggestion to you, in light of all we’ve covered today, is that you do what I did: buy one or more of the parts that are currently plastic on your guitar, change them out and see if you like the difference. Remember, most of these parts are under $20; many under $10!! Switching from plastic will up your tonal game. You’ll hear the obvious benefits, and your music and your audiences will gain the benefits. If you go for it, let us know the results here at Serious G.A.S. Throw us a comment and describe the difference in sound you experienced. For now, I’m going to go investigate those mammoth parts… I think the caveman in me is COMIN’ OUT!! !